Birthday: May 30 Height: 133 cm Weight: 34 kg Three sizes: B61/W47/H62 A young Teutonic aristocrat, she traveled to Japan to participate in the Holy Grail War as a Master. Illyasviel has an angelic appearance and an unsurpassed degree of magical power. She lives in a castle on the outskirts of Fuyuki City, accompanied only by her Servant and two maids. 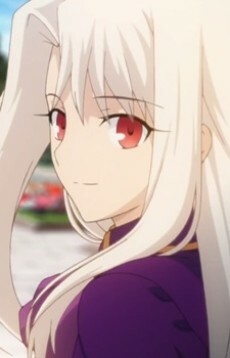 Illyasviel asks those she feels comfortable around to simply call her "Illya". In the Fate/Zero novels it's revealed that her father is Kiritsugu Emiya. Her servant, Berserker, is the legendary Greek hero Heracles. This, along with her aristocratic upbringing, give her a sort of arrogant attitude, especially during battles. She develops an attachment to Shiro early in the Grail War, calling him "Big Brother", and offering to spare him in exchange for serving her. After Berserker is defeated by Saber and Shiro, Ilya comes to live with Shiro at his home. Taiga becomes a sort of big sister to Ilya, taking care of her whenever Shiro is away, even after the Grail War ends.